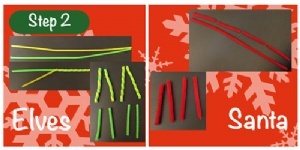 - Chenille Stems - Specifically red, white, green and yellow. Plus some other extra coloured stems. - Craft Paints - Red, white, yellow, green, pink, gold, black and skin tones. - Scissors (Kids may require assistance cutting the chenille stems). First we must build the components that make up our characters body. Heads - shaped and tweaked from a small ball of dough, pinch out some pointy ears for the Elves. For Santa - sculpt his beard as part of his head. You can create facial features like cheeks, a slight brow for the eyes to sit below too. 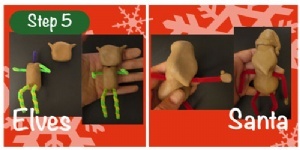 Torsos - roll a medium sized ball of clay into a sausage for the Elves and for Santa, start off with a bigger ball of clay to mould into a pear shape. Hats - Using a small ball (less than you used for the head) roll the clay into a tapered point, taking care to make sure they are good sizes for the heads. 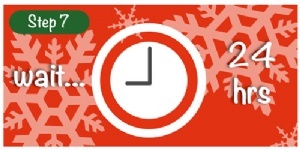 Santa's hat will be folded over while the Elves hats are quite straight and pointy. Noses - small ball of clay for the center of each head. After you have created the shoes for each of the characters, push a chenille stem into the top of each shoe, where your characters leg will go for when we attach them later. Set the shoes aside to dry - will glue them on and paint them last. Hands / Gloves - a small ball squashed flat with a smaller ball stuck on as a thumb. 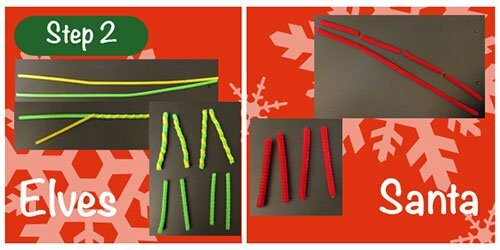 Now that you have your basic body parts for Santa and each of his Elves, get your chenille stems ready for cutting (red for Santa and yellow and green for the Elves). Santa needs two red arms and two red legs. 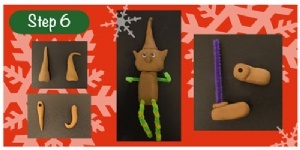 The Elves need two green arms each, and two striped legs each. You can create a striped look by wrapping your green and yellow chenille stems around one another. These must be cut into equal lengths for the Elves' legs. We are now going to construct the characters' bodies. Carefully push Santa and his Elves' torsos down onto a flat surface / the table you are working at to create a flat base at the bottom so that the characters will sit / balance once they are dry. After flattening the forms push a length of the other colour chenille stem (not your red, green or yellow) into the centre of the torso vertically to create a spine. There should be around 2cm / or more sticking out of the top and it is for the head to sit on. Now that your characters have heads and torsos, they need their limbs next! The red chenille stem lengths you have cut will be Santa's arms and legs. 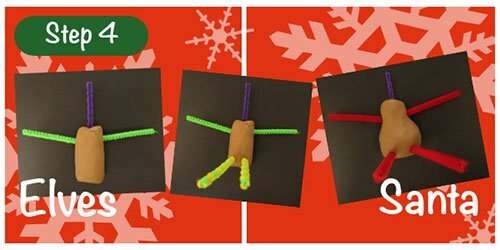 Push a length of red chenille stem in at each side for his arms. 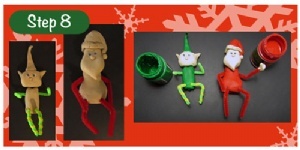 Do the same for the Elves with your green lengths of chenille stem. Push the two remaining red chenille stem lengths horizontally into the bottom of Santa's torso, and repeat this action for the elves with their striped chenille stem lengths. Gently and carefully push the heads onto each of the torsos, taking care not to squash your characters' facial features. If some of the chenille stem shows through the top of your characters head this is okay as we will still be placing their hats on them. You can push two googly eyes into the clay of your characters face - place them as near or far apart as you like. *If you do not wish to push them into the clay at this stage, you can wait until the painting process to glue them on instead. The clay should still be tacky and we are now going to add the hats to our characters heads and their noses to their faces. Take any spare length of chenille stem and poke holes into each of your characters hands and shoes, for when they will be attached to your characters. We will glue them on once they are dry but it is helpful and sturdier to have the holes needed to slot the chenille stem arms and legs into. The construction of your characters is complete. Now you must give the air- drying clay time to properly dry - a full 24 hours is recommended as the characters are dense. Your characters have dried completely and it is time to start painting / decorating them. During the drying process you may find that things have shrunk a little/seem tighter (the heads and torsos on the chenille stems). This is normal as all the moisture from the air-drying clay has now evaporated. 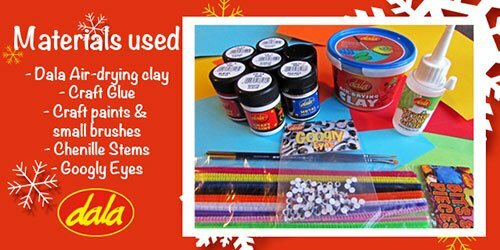 Now is a good time to glue on the googley eyes if you didn't push them into the clay in Step 5. Use the first image of the characters in this tutorial and follow the suggested decoration/painting design instructions below - or use your own design! I coated his hat and torso in two coats of red craft paint. I painted the rim of his hat white, and the pom pom on the end of his hat white. I painted his face in a flesh tone and his beard white. Remember to paint santas hair on in white too, round the back of his head under his hat. I gave him white eyebrows and a pink mouth, and painted his nose pink too. Then I painted the white furry trim of his jacket down his middle, and went round his waist. Above that I painted a black belt with a pale gold square for a buckle. His shoes and gloves I painted black. I then glued these onto his arms and legs, using the holes we made in Step 6, with Styrofoam Glue. I coated their torsos and hats in 2 coats of green craft paint. I painted their faces with different flesh tones, and painted hair round their heads / under their hats. They also have pink noses, but unlike Santa they have pink rosy cheeks too. I then painted on yellow lapels at the tops of their torsos. Just like I did for Santa, I painted a black belt around their waists and also added a pale gold square on the front as a buckle. The elves have also got three gold buttons running down their shirt fronts. I painted their gloves white and their curly shoes black. 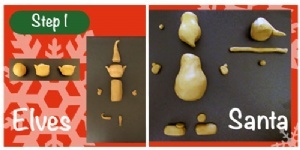 I then glued these onto their arms and legs, using the holes we made in Step 6, with Styrofoam Glue. Lastly I trimmed their hats with some left over yellow chenille stem. You could continue to trim round their cuffs and legs too if you want. Lastly, to add to the scene I made candy canes from chenille stems (red and white twisted) for the elves to hold. 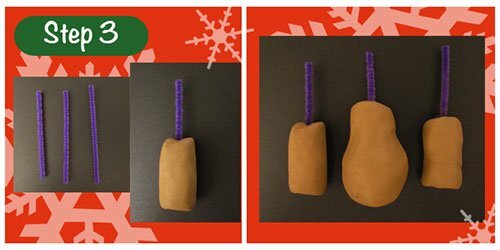 I also used some air-drying clay to shape presents (squares I hand shaped) and painted them to look like wrapped gifts. Place your new Christmas ornaments somewhere safe before and during display. They are fragile and will break if dropped / they fall from a height. Extra - Make some presents for the characters to sit amongst and candy canes to hold! This item has 702 views.